Jamie MacDougall talks to composer Stuart MacRae and librettist Louise Welsh about their 4th opera collaboration, 'Anthropocene' and Gareth Williams introduces 'Future Classics'. 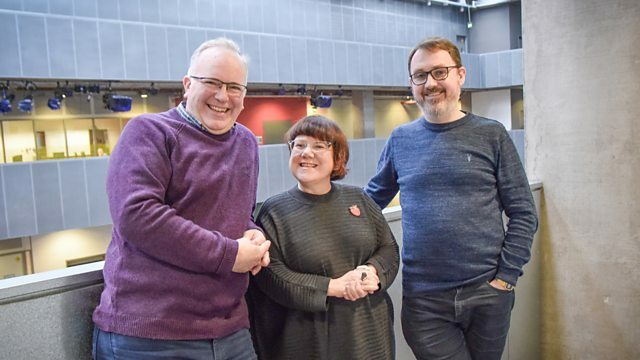 Jamie MacDougall talks to composer Stuart MacRae and librettist Louise Welsh about their latest Opera collaboration, 'Anthropocene' and Gareth Williams introduces another potential 'Future Classic' composed by Colin Riley. Jamie's album of the week, 'The Polish Violin', is by violinist Jennifer Pike and pianist Petr Limonov. Performer: Jennifer Pike. Performer: Peter Limonov. Music Arranger: Pablo de Sarasate. Gilbert & Sullivan: HMS Pinafore. Orchestra: Lahti Symphony Orchestra. Conductor: Osmo Vänskä. Sibelius: Symphonies 6,7 & Tapiola. Mozart; Chamber Orchestra of Europe, Maria Pires - Piano. Sonata No 1, 3rd mvt. Performer: Michael Foyle. Performer: Maksim Štšura. Lutoslawski;Penderecki - Co,plete Music For Vioin And Piano. Performer: James Ehnes. Orchestra: Royal Liverpool Philharmonic Orchestra. Conductor: Andrew Manze. Vaughan Williams: A Sea Symphony / The Lark Ascending. Performer: Jennifer Pike. Performer: Peter Limonov. Performer: Tom Lessels. Performer: Kate Halsall. Performer: Genevieve Wilkins. French Ballet Music Of The 1920's. Joseph Moog: Debussy / Ravel. Performer: Dewi Rees. Author: Samuel Crossman. Choir: The Choir of Jesus College Cambridge. Director: Richard Pinel. Orchestra: Luxembourg Philharmonic. Conductor: Gustavo Gimeno.